For a moment that lives in WWE and wrestling infamy, the Montreal Screwjob continues to get exposure as recently as the Payback PPV. Bret Hart's career accomplishments almost get brushed aside whenever you see him in the WWE nowadays. It always comes back to the "screwjob". 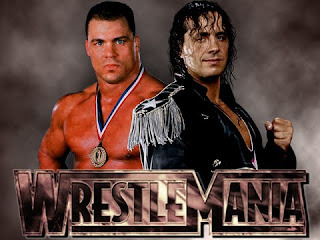 It's a shame, because Bret Hart was one of the greatest technical wrestlers we'll ever see. As a young teen, I failed to appreciate the calculating style and in-ring psychology Hart provided. But if you go back and watch, it's like, as they say "poetry in motion". I'm not sure if the generation who missed that era in the WWE can appreciate his ability compared to today's seemingly high impact style, but it's undeniable that he's a legend. 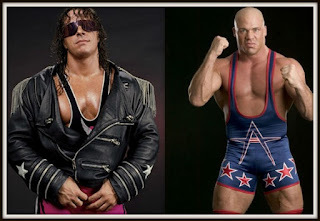 While Hart was mired in the sludge that were the dying days of WCW, Kurt Angle surfaced in the WWE. Angle almost channeled a quasi-version of Hart, using alot of his amateur background during his matches. It took Angle a bit, but eventually he was cutting solid promos, on his way to becoming a main event talent. And who can forget his backstage work with "heel" Stone Cold Steve Austin? This potential dream match had a built in conflict, Canada versus the United States. 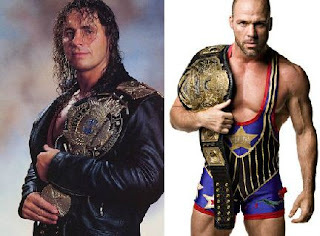 Not exactly an issue between the two countries in real life, but years earlier Bret did a good job of stirring up a kayfabe world of Canadians versus Americans. What a perfect opportunity for an eventual feud with a gold medallist who represented the United States in the Olympics. While Hart worked the storyline of anti-American before he left for WCW, he didn't have an adversary the likes of Angle. This could have been one of the great rivalries in WWE history, in the ring and out. Angle has mentioned in recent years that the WWE wanted to have this match occur at WrestleMania, the year before Hart made his in-ring return versus Vince. On paper, yes, this would have accomplished the goal of a dream match, but it wouldn't have been the same. Bret Hart was not in the ring shape he was during the prime of his career. 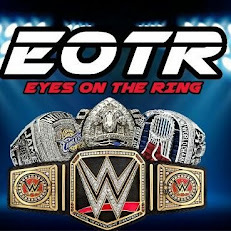 And if you watched his match with Vince, you saw every bell and whistle imaginable, also know as relentless interference from the Hart family. 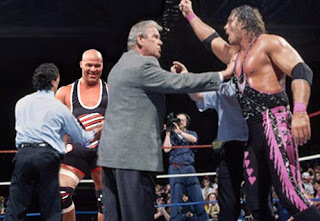 You can argue that while Bret Hart has had a legendary career, he still has had his share of hardships as well, whether it's the aforementioned "screwjob," the aftermath from the screwjob, a failed run in WCW, and most notably, the unfortunate and tragic passing of Owen in a WWE ring. These days, Hart comes off as a negative voice when it comes to discussing the WWE, sometimes for good reason. This persona fits in perfect for a feud, albeit with Hart's in ring performance going back to his glory years. As the heel, Hart cuts a promo degrading today's current product while Kurt Angle, gone from the WWE for just about a decade, music hits to a massive pop. Angle asks Bret, "what's happened to you? You used to be the Excellence of Execution, but now you're the Excellence of Complaining. It's true, it's damn true" or something of that nature. It's dream match scenarios, not Shakespeare! Keep on dreaming! Who would win? Bret or Angle? You decide!